I added this work table last week. It’s just sitting on top of the aft cabin.It’s a good work height, and holds all the stuff I need again and again. Now I don’t have to climb out of the boat so often. I wish I’d done it a long time ago – my knees are feeling the strain of this work. I’ve been building this thing for 2 1/2 years now, almost every weekend, and a couple of nights a week. The end is in sight though, I just got my last 2 sheets of plywood delivered today, and the interior construction is approaching completion. Now more finish work, priming and painting, electrical, and plumbing. 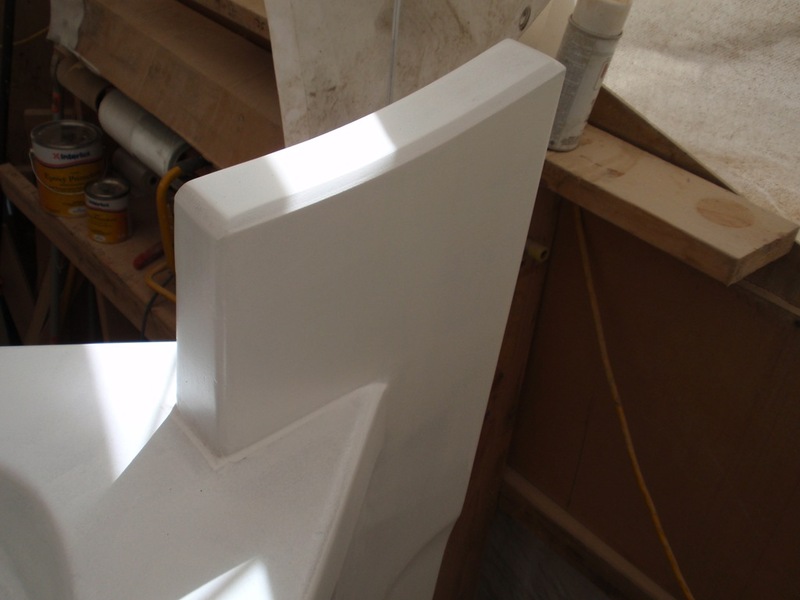 Seat box – the driver and passenger seats go on top of this. The cutout on this side is for binocular storage. The larger one on the far side is to the storage under the stove and sink – for dishes and food. Fresh and grey water tanks, water pump and bilge pump below that. Batteries and charger go below the sole at the bottom of the picture. I added 3 floors there today to support the weight of the batteries. I primed the bow and the stem post. It still needs some sanding, but the primer makes it look a lot more finished. I’m about ready to prime the whole inside of the hull and the gunwales. This is a lot of area because of the high bulwarks all around the boat. 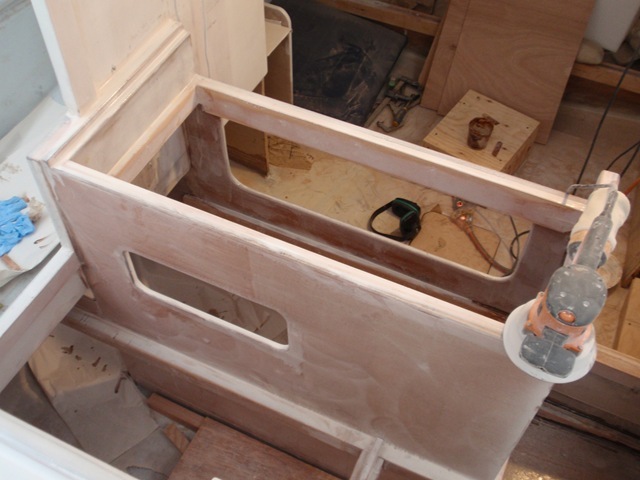 I’m also finishing the space under the pilothouse sole. 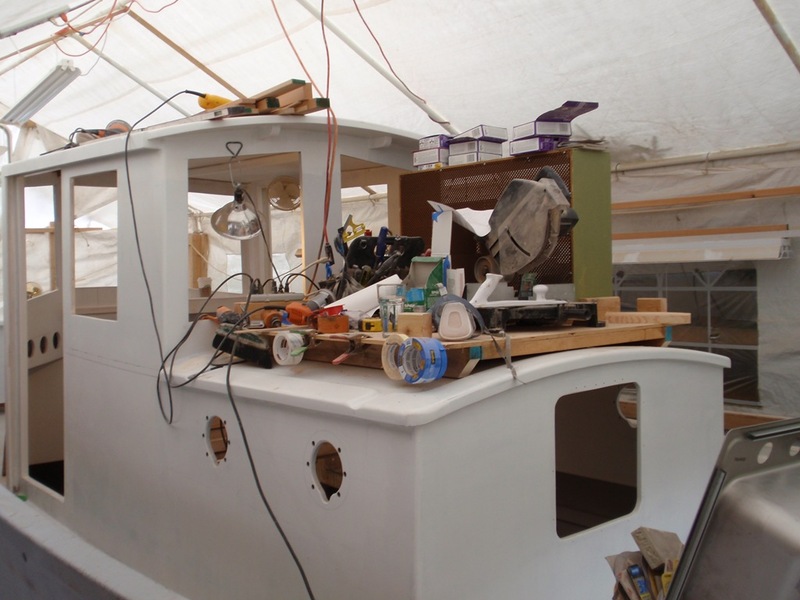 The forward area will hold the batteries, and the rear area will have the fresh and grey water tanks, with the galley above. 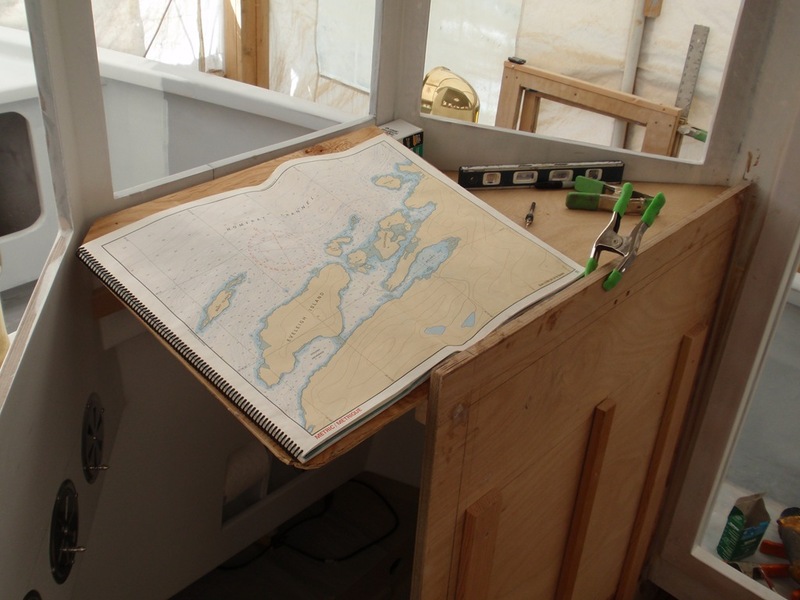 Inside the pilothouse, just forward of the steering station. This is a removable board sized to hold a standard large chart book. It will lift out for access forward to the head. The part on the right is fixed and will be used to mount electronics. 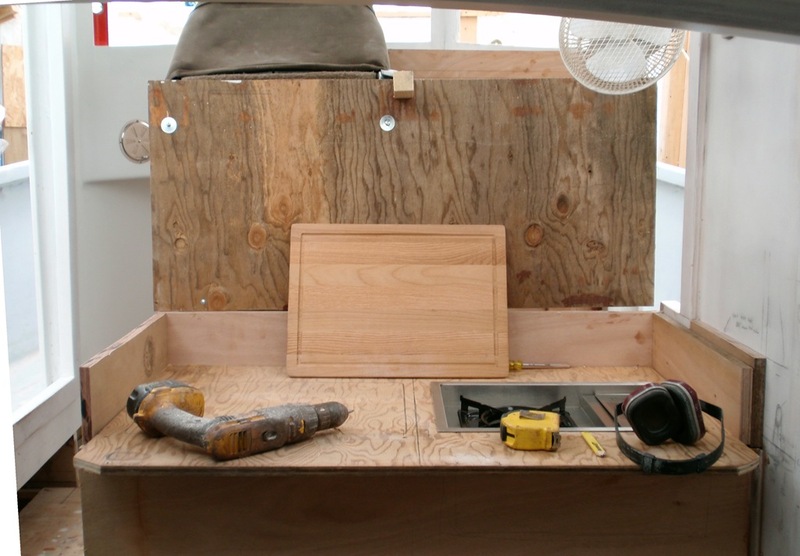 Here’ a shot of the galley roughed in. The butane stove is dropped into the cutout on the right. The cutting board covers the stove. The sink will go on the left, where the drill is now. The photo is from the aft cabin facing forward. 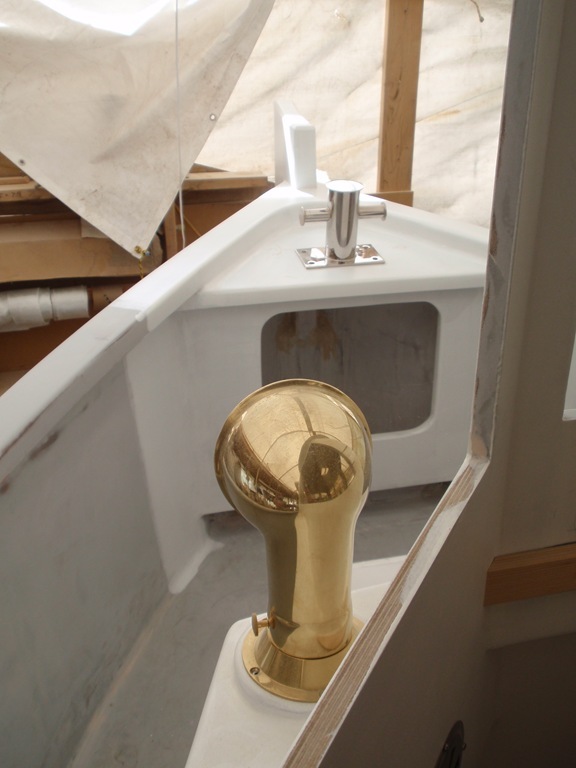 The vertical board is the underside of the pilothouse seat mount. The seats tilt forward to give access to the galley.